Ain't no party like The Root 100 gala! To quote the great prophet Joanne the Scammer, "Honestly, truly … " The Root 100 gala fills a sprawling, well-decorated room with black philanthropic celebrities, passionate activists, truth-telling artists, hardworking sports stars and more who all have one common goal: sharing their vision to help shift and shape the entire world. The collective vision of these special people landed them on the high-profile list. Every spot is carefully hand-picked by The Root’s staff through a strenuous process that includes debates, rankings, relisting and more debates. The final lineup is a shining example of excellence throughout the black community. And on Nov. 14, we gathered many of our amazing honorees—like Valeisha Butterfield-Jones, Bomani Jones, Symone Sanders, Misha Green, Luvvie Ajayi, Elaine Welteroth and many more—for an epic celebration that included words of inspiration and twerking through the latest trap anthem. Because who says you can't have both? The Root tapped (see what I did there?) Apt 33, a tap dance collective, which includes the beautiful Maude Arnold, known as one of the tappers from the Syncopated Ladies, to kick off the show with an incredible performance of "Glory" by John Legend and Common. The legendary tap dancer Bill "Bojangles" Robinson was the first black vaudeville dancer to perform onstage sans blackface, and it's his position as a pioneer that led the Apt 33 dancers to tap. Tap has strong roots in African culture, and it's amazing to see that this style of dance is timeless. The Root’s publisher, Donna Byrd, gave a fantastic and inspiring speech that focused first on honoring the late Gwen Ifill, the veteran journalist and star in black news who had died earlier that day. Byrd then noted the rough week that we've all trudged through. "For those of you who have dusted off your passports, you're not alone. For those of you who've had Kendrick Lamar's 'Alright' on repeat, you, too, are not alone," Byrd said. Black folks all over America have been considering leaving the country in light of Donald Trump's election as president, and the racist acts that have followed the win have led us all to believe that things are not "Alright." Byrd's encouraging words were the best and blackest way to usher in the awards ceremony. "The Root was born for this moment," Byrd said of the trying times in a post-Obama America, "and we are ready." Ajayi took the stage pointing out that part of her wanted to do the speech she had prepared, but another part of her wanted to make fun of white people, specifically white women—who showed up in great numbers at the polls in support of Trump. "This last week has been awful, at the direct fault of white women. We're used to getting blamed for a lot of things that happen in the world," Ajayi said of the election that came out in Trump's favor. She then went on to say that she was able to get some relief in blaming white women. "History has protected white women. White men always get the blame, but we haven't talked about the past's aggression in white women," she said. OK, so maybe I am a little biased because she's my fabulous boss lady and I helped pick out the skirt, but nothing says black pride like wearing Jean-Michel Basquiat. The Root 100 is more than a ceremony that honors incredible black people who contribute to the world. It's also a party. After dinner, the guests were escorted downstairs for dancing. DJ Jon Blak was spinning tracks like "Formation" and "The Wobble," and the floor was packed with activists, educators, politicians and more. Early in his set, DJ Jon Blak played Crime Mob's classic "Knuck if you Buck," and everyone and their mamas lost it (and continued to lose it) all over the dance floor. About half an hour later, the DJ was playing the song again. You'd think the crowd would have stopped dancing to shoot him their best "We already heard that" look, but as soon as Diamond's "Yo we knuckin' and buckin' and ready to fight" played out, the whole room jumped with excitement. The former national press secretary for Bernie Sanders and current CNN commentator brought nothing but bustling energy and blackness to the stage. "Black people are so resilient," she stated. "It is young people who monumentally changed the course of American politics over the last year and is extremely important that we remember to keep it truth to power." Did I mention that she's only 26 years old? The entire room felt powerful after her words. In fact, Anthony Hamilton or John Legend should have been humming throughout the whole speech. "I'm encouraged because we stand on the shoulders of people like Fannie Lou Hamer, Shirley Chisholm … ," Sanders exclaimed to a roaring room. She challenged everyone in the room to be a doer and trailblazer because "now is the time!" Michael Arceneaux is one of The Root’s strongest voices. He's always a truth teller who brings laughs in every line he writes. Arceneaux's writing absolutely shows up in his offline personality. 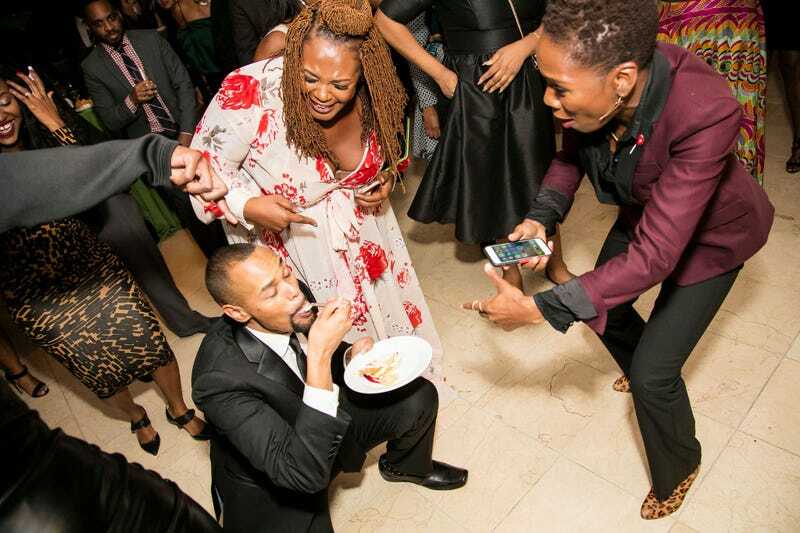 During the reception, with a plate of sweet potato pie in hand, Arceneaux dropped it down to the floor while Beyoncé sang about putting her hands up and spinning. Luvvie Ajayi and I, along with many other attendees, "yassss'ed" until we could yasss no more. It was glorious.